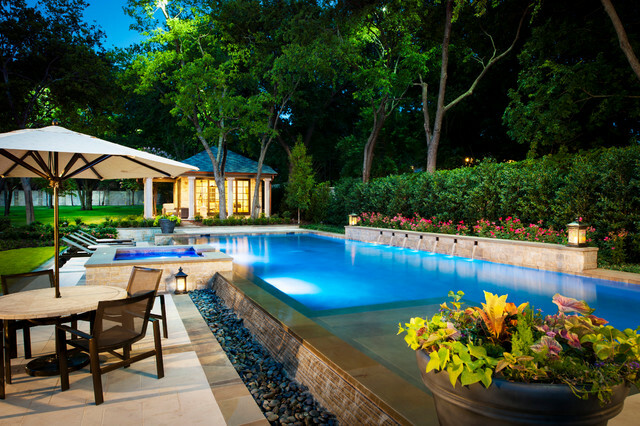 Pennsylvania Stone - Traditional - Swimming Pool & Hot Tub - Dallas - by Pool Environments, Inc.
Our client wanted a simple, rectangle pool, long enough for swimming laps. Their desire was for simplicity and understated elegance. A reverse negative edge, flowing back toward the house is both visually enticing, and creates a pleasant babbling brook sound, as the water trickles down the stair- stepped Pennsylvania ledgestone face. The water flows into a hidden trough filled with Mexican beach pebble. nice water flow, also nice with the roses.